I started today out joining the tourists and driving through a redwood tree…well, I was told VANilla wouldn’t fit, so I had to drive around the redwood tree. Regardless, I’d call the “Drive-thru Tree” a tourist trap and a waste of five bucks! Perhaps that was because during my recent trip to Africa we got to drive through a tree in the wilderness and take as many pictures as we wanted without dodging the next car coming through. 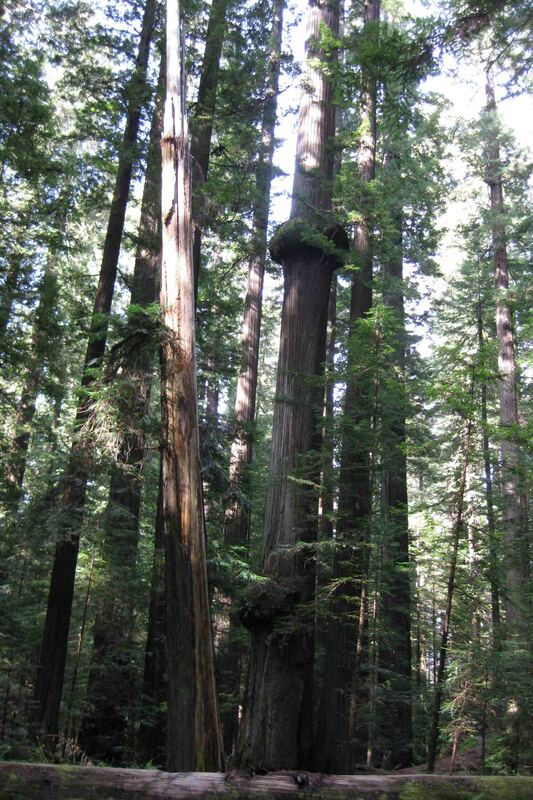 The Chandelier Redwood Tree stood 315 feet high, is approximately 2,400 years old, and has a diameter of 21 feet. A chandelier tree is a tree whose branches become injured or bent and upon continuing to grow, the branches attempt to correct the odd angle by growing upward. 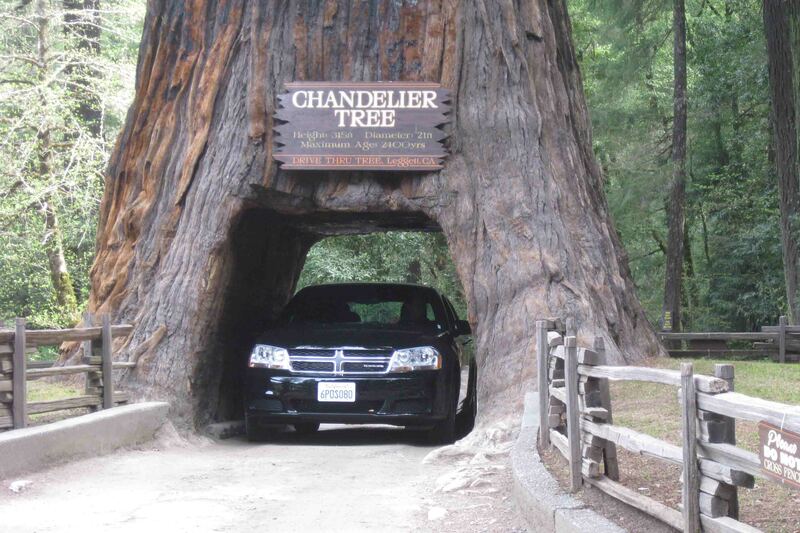 After driving through the tree, tourists could visit the gift shop and even purchase a redwood (twig size) for $9.95. A few tourist traps I didn’t visit were Confusion Hill and Legend of Big Foot. After spending about ten minutes at the Drive-Thru Tree Park, VANilla, Petey, and I hurried off to Richardson Grove State Park. Here I met Claude and Naomi, also owners of a Eurovan. They were just finishing up a 1,000 mile journey to see friends around California. In their younger years, they sailed their boat, Destiny, from San Francisco to Nicaragua, a country ravaged by civil war and poverty and helped them find God. They have written a book called Our Destiny which can be found at www.authorhouse.com. Claude and Naomi gave me a map of Northern California and filled me in on the good rest stops and local campgrounds north of Eureka before we parted ways, and I explored the park. 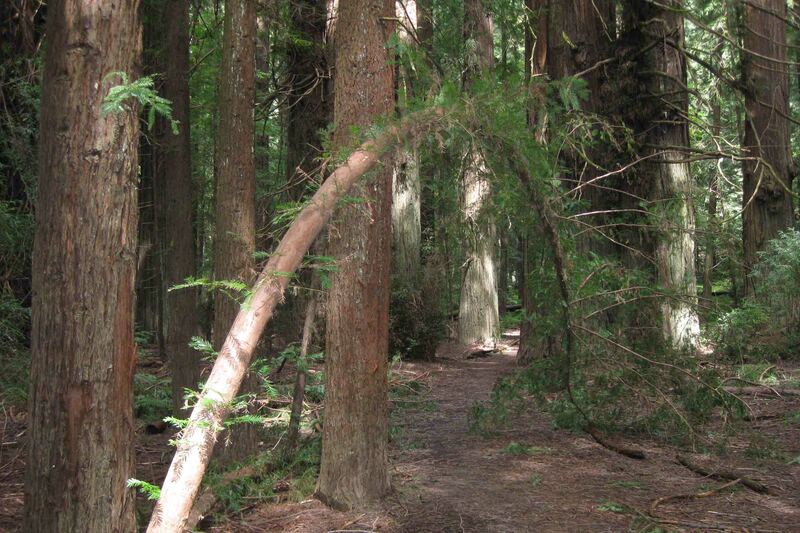 A variety of interpretive and hiking trails criss-crossed the campgrounds and picnic areas situated near the South Fork Eel River. Petey and I took the interpretive trail first that wound through a grove of redwoods, which eventually became the theme for the day. The most interesting educational piece was of a cross-section of a fallen tree. Its rings were marked with a timeline. The tree began its life in 700 A.D. while Europe was beginning the medieval Middle Ages. The tree was scarred by fire in 1147 A.D. as well as in the 16th, 18th, and 19th centuries. At 1200 years of age and weighing 500 tons, the tree finally fell in 1933. During the tree’s lifetime, the following events occurred: the Coronation of Charlemagne (800), William the Conqueror invades England (1066), the Magna Carta is signed (1215), Columbus reaches America (1492), Drake lands in California (1579), Declaration of Independence signed (1776), Gold discovered in Coloma (1848), San Francisco Earthquake (1906). How short does your life feel now?!? Later, I left Petey in VANilla to walk down by the river, as the park posted a warning that certain algae in the water is dangerous to dogs. I certainly don’t need any more vet bills. The water was a beautiful sky blue. I attempted to venture along a trail that crossed over the river to get a better view, but the bridge was a seasonal bridge and currently not in place. 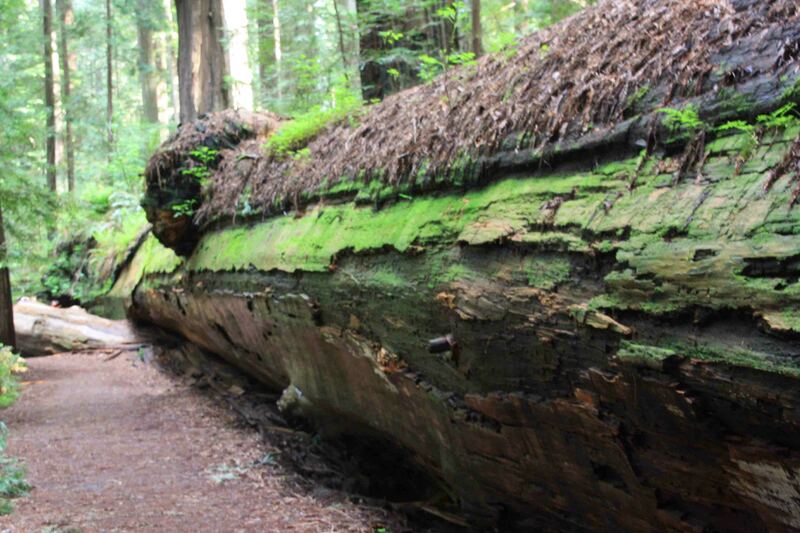 With that, we decided to explore the Humboldt Redwoods State Park and the Avenue of the Giants. 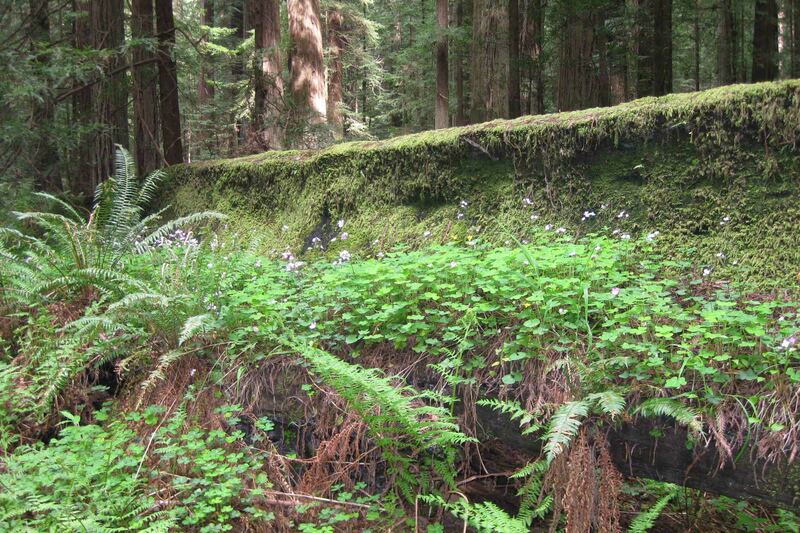 The Avenue of the Giants, originally built as a stagecoach and wagon road in the 1880s, is a 33 mile stretch of road that generally parallels Route 101 as it winds through one of the state’s largest redwood forests. A self-guided auto tour takes visitors to nine different stops in the forest that mark short, manicured trails, interpretive trails, historic sites, and memorial groves. In addition to these locations, several other turnouts and trails pepper the area. 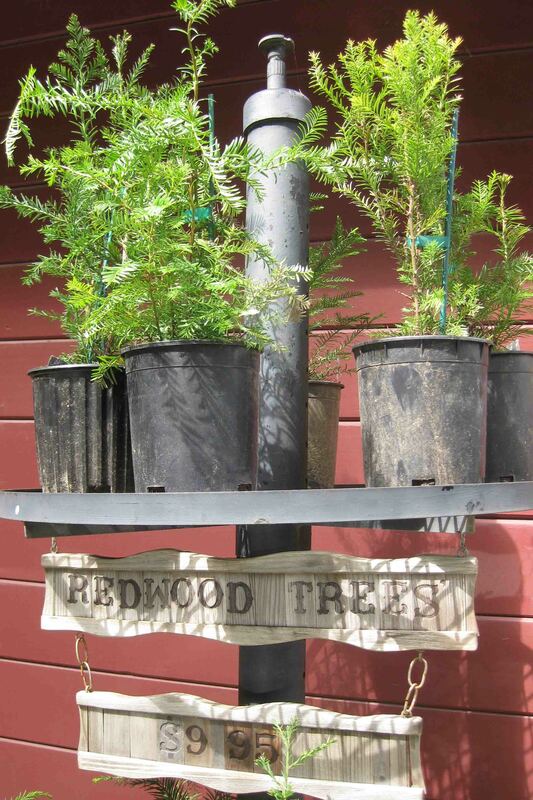 Redwoods grow best at elevations above 2,000 feet in areas of heavy winter rains and require moderate temperatures. 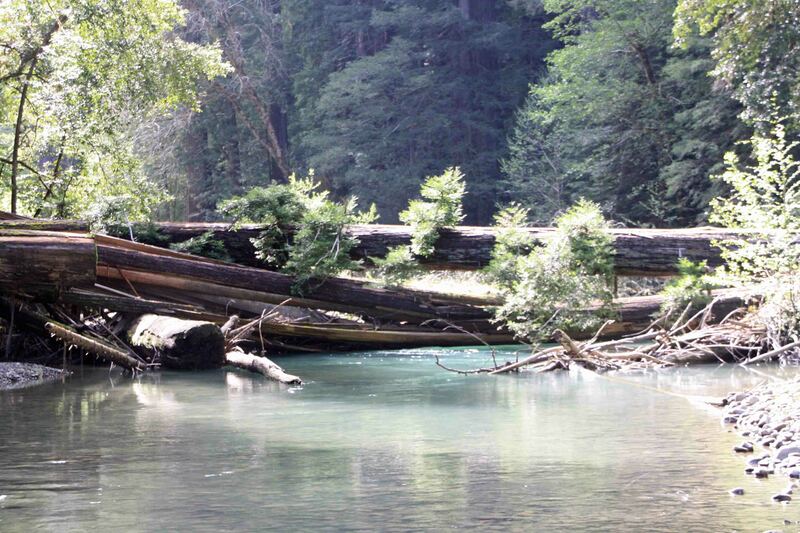 When the rains slow from June to September, redwoods sustain life by wringing water out of summer coastal fog. The trees’ shallow roots extend for many feet and interconnect with other trees to hug the earth and keep from falling during wind storms. The root system is also able to re-establish itself after flooding. 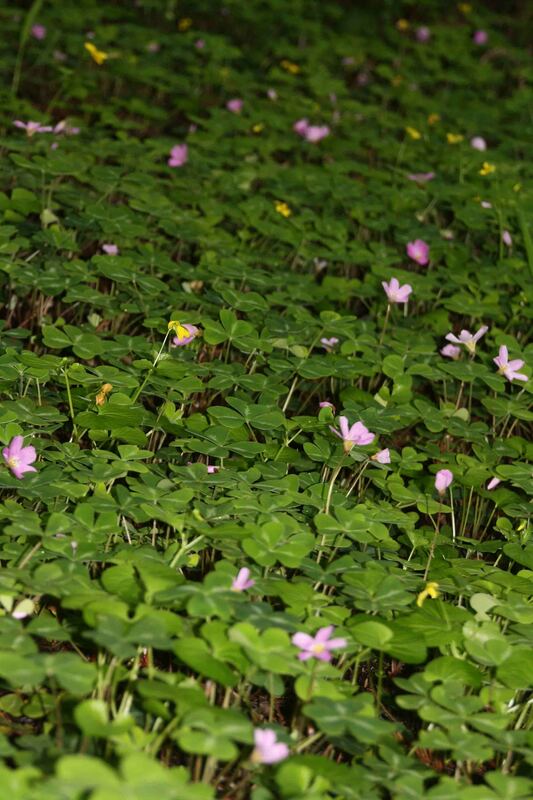 Its thick bark protects it from fire and insects. 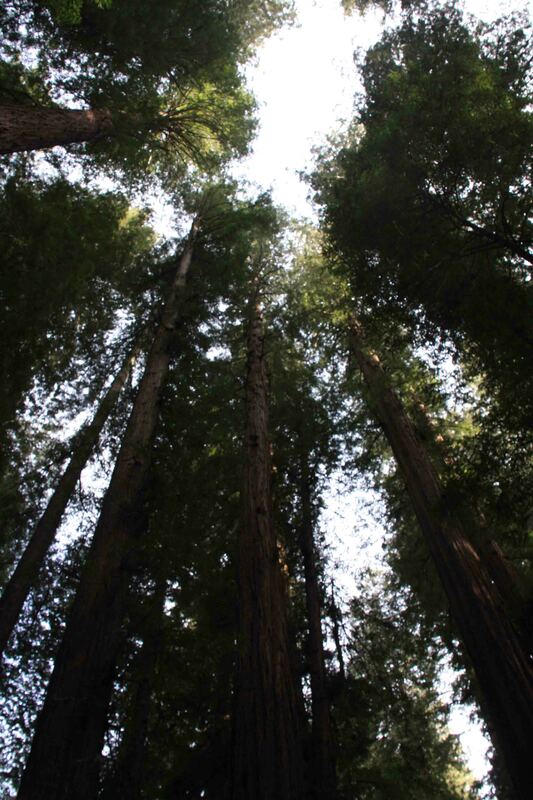 These are reasons why of the world’s trees, none grow taller than the Coast Redwood. 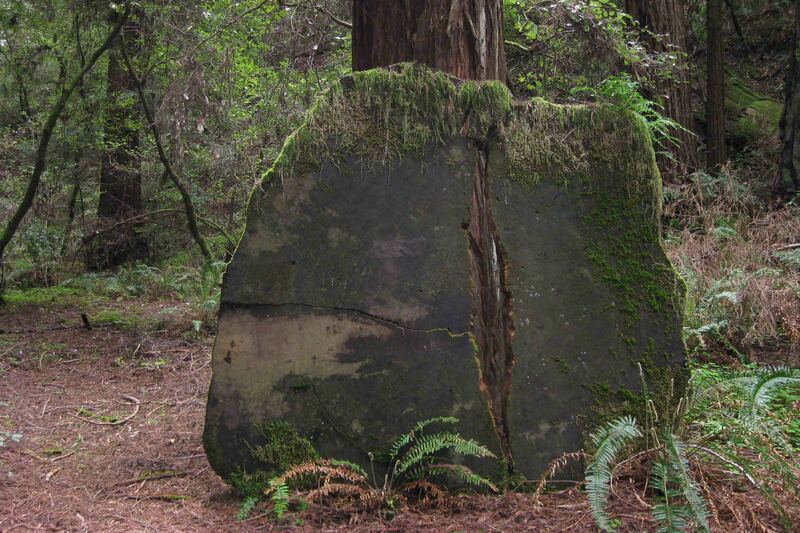 A common sight on many redwoods is a wood growth known as a burl. A burl begins as a small bud that remains dormant instead of developing into a branch. While the tree grows, the bud divides, producing more buds. If the bud mass increases in size more rapidly than the supporting trunk a lump or burl forms. Burls can range in size from a walnut or to world-record 61 tons. Bollling Grove where the Humboldt Park began. Then we continued a bit further to Weott, another stop along the Avenue of the Giants. Weott, once a bustling town, was devastated by a flood in 1964. The flood waters, caused from 32 inches of warm rain falling in three days which melted the snow pack on nearby mountains, raged 33 feet overhead. During the flood, about thirty miles downstream from Weott in Fernbridge, the river’s flow was greater than the average flow of the Mississippi and Columbia Rivers combined! Shortly after leaving the high water mark in Weott, we visited the Mahan Plaque. Laura and James Mahan were pioneers in the Save-the-Redwoods League. 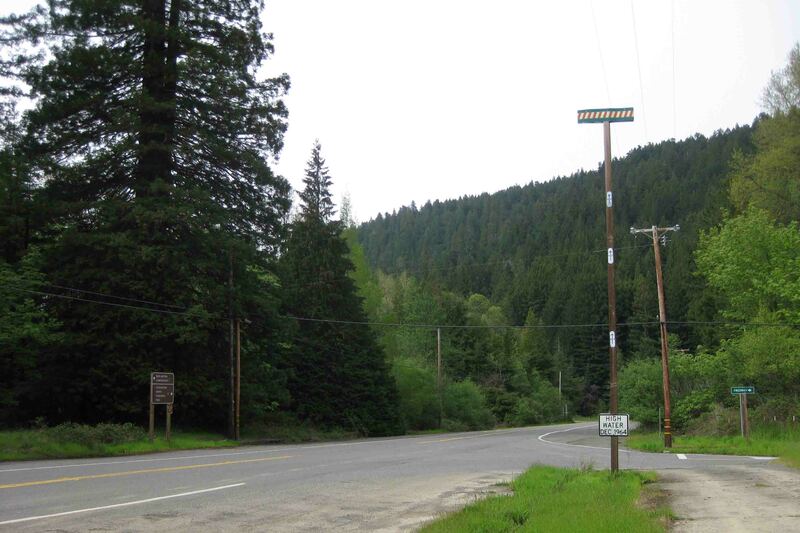 The plaque is located at the site where on November 19, 1924 the Mahans discovered that logging had begun which led to the movement which saved this grove. Further down the road, we arrived at Founders Grove which is home to what used to be the tallest tree in the world until it fell in 1991. A one mile loop trail took me by the Dyerville Giant that once stood at least 362 feet (two feet taller than Niagara Falls and comparable to a 30 story building) and measured 17 feet in diameter, 52 feet in circumference, and weighed over 1,000,000 pounds. How did the Dyerville Giant fall? During the rainy season, the soil became very saturated with water which caused a tree to topple. As it fell to the ground it hit another tree. After a week of leaning, this tree fell and struck the Dyerville Giant causing it to crash to the ground. While no one saw the tree fall, a park neighbor who lives more than a mile away reported hearing crash and thought it was a train wreck. A tree over 50 feet away had mud splattered 15 feet up its trunk from the impact of the Dyerville Giant hitting the ground.